Help Identify Photo Picture Classic Cars for sale & Classifieds - Buy Sell Classic Car & Classic Truck Classifieds. 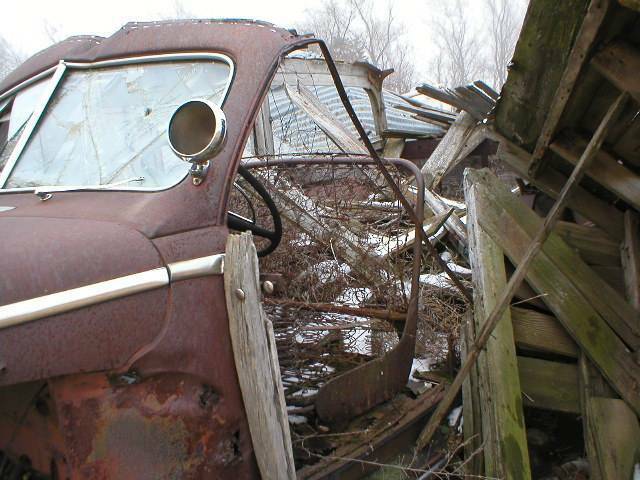 Can you identify this Rusty Ride? Looks like a bunch of fire wood. I would say it looks a little like a 1940 Ford Deluxe. I can't really tell because the whole back is missing. NO IT'S NOT A 40, OR A 41. It is a 46,7 or 8 i have one , a sedan, the dash tells it.....and the so does the hood, on a 39, 40 the curve over the fender is tighter, not so straight, look at the previous pic of same car from rear seat angle, the dash gives it away. it is....was a 47 woody.